If you’re a parent of a teenager, you probably have more things to worry about than hours in the day. But it’s important for your teen to know the importance of dental health and the effects his or her behaviors can have on the teeth. 1. Chewing objects can damage teeth. Does your teen chew on her pen or bite her fingernails? These objects can be covered in germs that might lead to infections, broken teeth or injured gums. Suggest your child chew sugarless gum, which can help prevent tooth decay. 2. Sugary food and drinks. The sugar in junk food, candy and energy drinks combines with bacteria in the mouth to create acids, which attack tooth enamel. Sticky and chewy candies are particularly bad for teeth because they linger in tooth crevices. 3. Smoking and chewing tobacco. Teens may think they’re invincible, but smoking and chewing tobacco are bad for their health and their teeth. The long-term health effects of smoking and chewing tobacco include mouth, tongue, lung and throat cancer, heart disease and stroke, gum disease and more. 4. Piercings. Piercings of the tongue or lip can cause oral infections. Teens frequently chip or break their teeth by chewing on the piercings. The tongue can swell and if the swelling is severe, it could actually cut off the airway, causing breathing problems. Learn more about how tongue rings can put your oral health at risk. 5. Poor dental habits. It’s important for teens to brush at least twice daily and floss once a day. Poor oral health habits put teens at risk for cavities on and between teeth. Teens are also at high risk for gum disease if they neglect to brush and floss regularly. 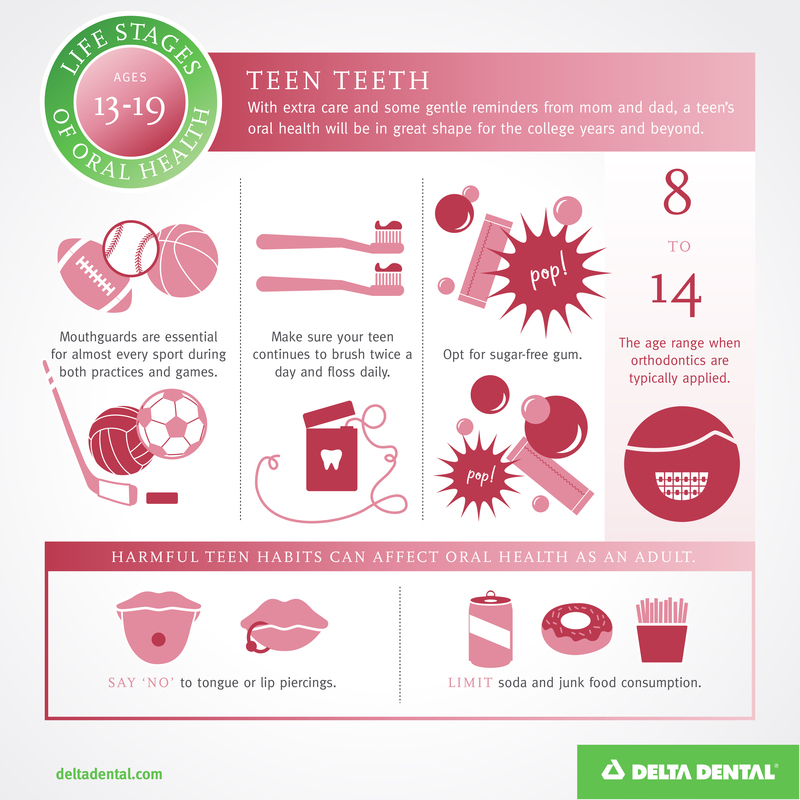 If you’re worried about your teen’s dental habits, talk to them about your concerns. Many kids are just not aware of the lifelong impact bad habits can have on their dental health. ← May the Force be With You – But Not on Your Teeth!